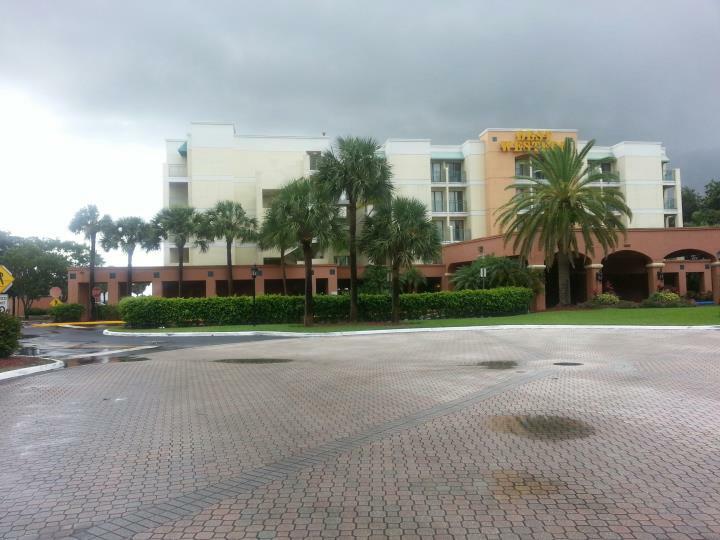 Protect your Deerfield Beach, Florida investment by hiring a quality professional commercial painter! 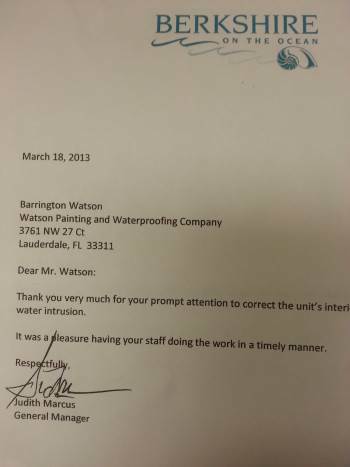 Since 1996, Watson's Painting & Waterproofing Company has proudly served Deerfield Beach, FL for its commercial painting needs. Over the years, we have painted Deerfield Beach offices, Deerfield Beach office buildings, and other Deerfield Beach commercial facilities. 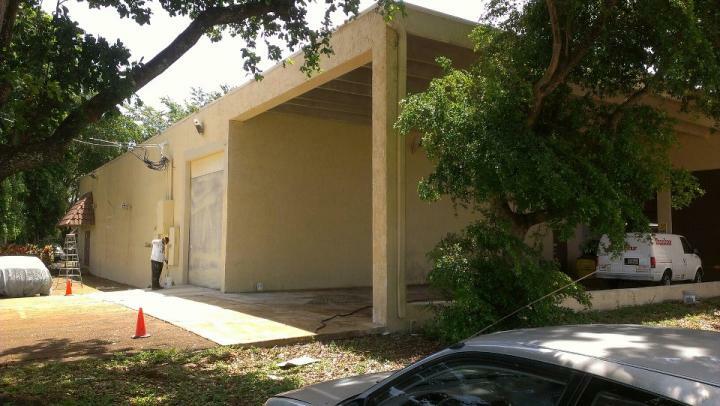 Watson's Painting & Waterproofing Company's Deerfield Beach commercial painters have the experience and skills necessary to complete the most challenging Deerfield Beach, FL commercial painting projects. They will leave your grounds as they found them, and conduct themselves in a professional and polite manner. 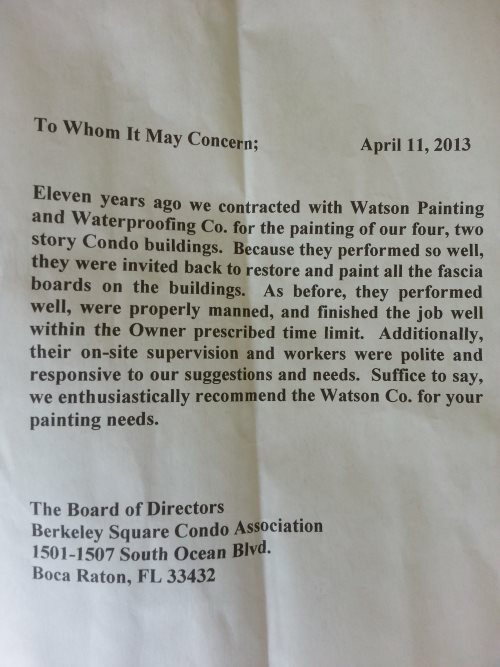 When it comes to cost-effective quality commercial painting in Deerfield Beach, FL, Watson's Painting & Waterproofing Company is the Deerfield Beach commercial painting contractor Deerfield Beach businesses trust. 5★★★★★ - "Barrington is the best! I am so happy I made that call. He gave me a fair estimate the same day and completed the job the next morning. The room looks amazing and I am so grateful!" 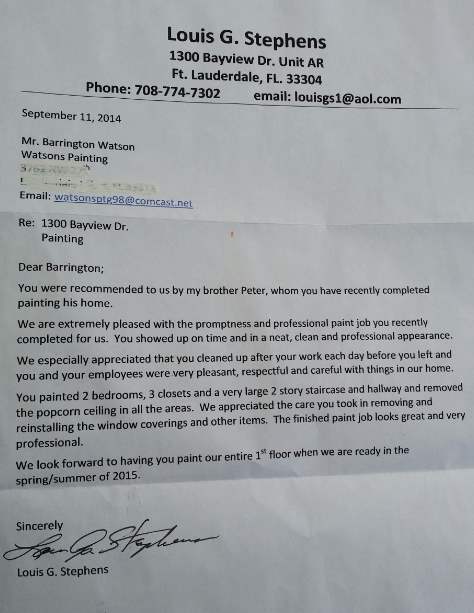 5★★★★★ - "Roof Coating Review - 10/10 Rating - Thumbs Up - Watson's Painting in Deerfield Beach"
5 ★★★★★ - "Hire these guys! Barrington is a man of his word. As a local real estate agent, I interact with many contractors. I contracted Barrington to paint my personal home. He and his crew did an exceptional job at a very fair price and I would recommend him to any of my customers. Greg Bates GregBates@Keyes.com 561-320-1967 GregBates.Keyes.com"
5★★★★★ - "Great painter! Showed up on time, gave us a great quote, started same day and was done painting my industrial shop the next day. Best customer service I've experienced in south Florida. Highly recommended!" 5★★★★★ - "Fast response and professional attitude right from the first contact. Worked efficiently and very clean. Will be using them again very, very soon." 5★★★★★ - "We are amazed and thrilled with the wonderful job Mr.Watson and his team did on repairing our drywall and painting and faux finishing our walls afterward. Our walls look perfect and no one could ever tell that there had ever been damage to our walls. Also, they are the nicest, most professional people you would ever want to meet. Thank you so much!" 5★★★★★ - "Wonderful experience, honorable gentleman and most excellent job!" 5★★★★★ - "We are amazed and thrilled with the wonderful job Mr.Watson and his team did on repairing our dry wall and painting and faux finishing our walls afterwards. Our walls look perfect and no one could ever tell that there had ever been damage to our walls. Also, they are the nicest, most professional people you would ever want to meet. Thank you so much!" 5★★★★★ - "Very professional great job"
5★★★★★ - "Excellent service! Great job! Very helpful and positive! Conscientious! Friendly. Great guys." 5★★★★★ - "Clean, professional, courteous service. We have used watsons painting for our business and personal painting needs for years"
5★★★★★ - "Mr. Watson and his crew did a great job and went over the top to make sure we were happy with his work"
5★★★★★ - "Watson's did an excellent job for me. They were on time, fast, courteous and thorough. They cleaned up after themselves completely. 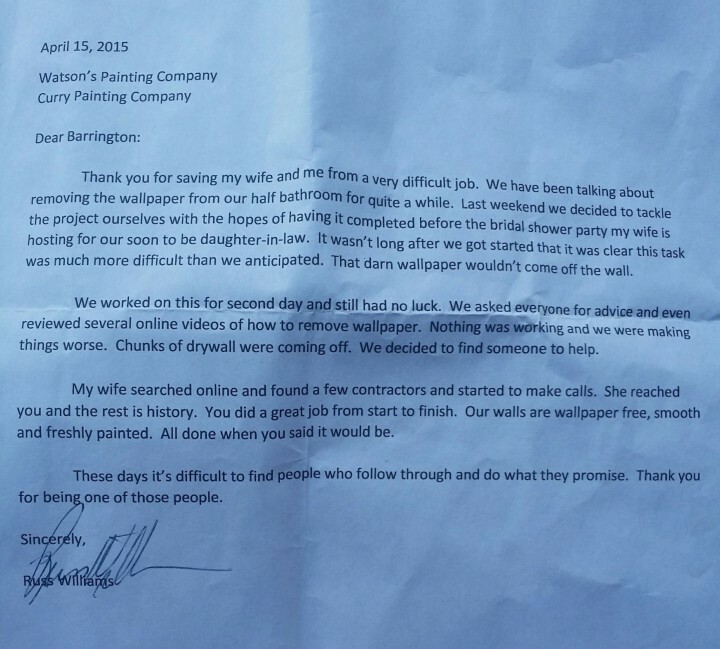 I would recommend them without reservation to anyone needing wallpaper removal or painting." 5★★★★★ - "Been in construction 35 years showed up did a wonderful job. Barrington is an easy man to get along with and he brings top-notch workers. They get a 10 out of 10"
5★★★★★ - "Great customer service. Did a great job. Highly recommend and would hire again. very professional." 5★★★★★ - "Mr. Watson & his team are incredible! We called them on a Sunday, and they were here Monday morning to do the work. They repaired several areas of our home and did so with complete professionalism. Mr. Watson and his team were dressed impeccably, they were punctual, provided great work quality, and cleaned up any mess left behind. We are grateful to have found such a wonderful company and even referred them to someone while they were still in our home working. They are truly an A+++ company and we highly recommend them!" 5★★★★★ - "I requested a quote to paint two bedrooms. They came out the very next morning promptly. They were very friendly and professional. They did a great job with both of the rooms and were able to get both rooms done in one day." 5★★★★★ - "I called Wednesday. They came out Thursday and pressure cleaned my flat tile roof and two flat roofs. Friday they sealed all the cracks and voids in my old coating. Today, Saturday, they fiber coated my flat roofs and sprayed white elastomeric waterproofing on my tile roof. No more leaks to worry about. I'll sleep better when it's raining. My roof was pretty bad, now it looks like new. Thank you Watson Painting. Barrington was on the job every day. I highly recommend these guys. I'll have them paint the exterior of my house as soon as I get some trees cut back"
5★★★★★ - "I hired Watson’s Painting to do drywall repair and painting after I had a water pipe break and they had to reroute my pipe. They did an excellent job both on the drywall and the painting. They cleaned up well and I am going to use them to paint my whole house in the future. I would recommend them highly." 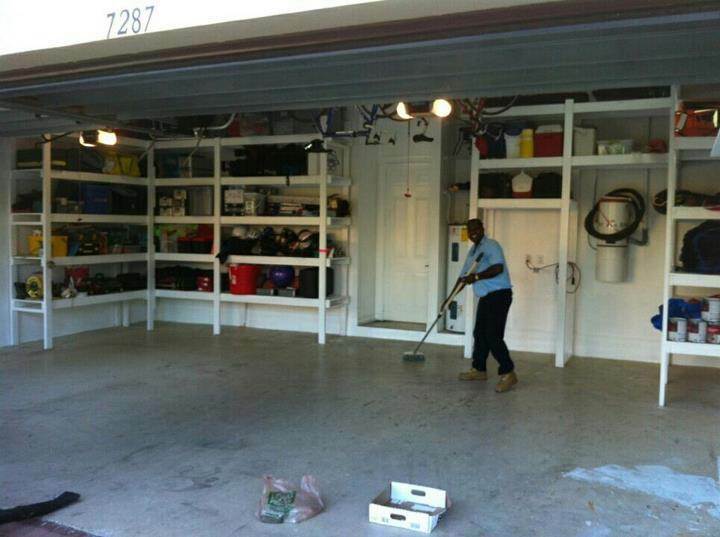 5★★★★★ - "I hired Watson's Painting Company and their crew to epoxy a 3 car garage floor for me in Coral Springs Florida. Barrington and his crew came out and did such a splendid job. After 8 months I had some wear and tear on my floor and I called Mr. Watson about maintaining my garage. He did not hesitate, came right over and gave me an excellent job. What he says he does. I was very upset at first, but when he came over and explained it to me, he took care of it for me without charging, I only had to purchase the materials that most contractors wouldn't do. He is such a wonderful young man. I will suggest him to all my friends and tell them about is business." 4★★★★☆ - "Barrington was professional and respectful. He did a great job and paid attention to detail"
5★★★★★ - "Barrington was a pleasure to deal with. I got a quote, a contract and the work completed all within a few days. We had our roof pressure washed and weatherproofed. They took great care to do a wonderful job. I am very happy with the results and would definitely recommend this company." 5★★★★★ - "They are professional and personal. I was pleased with everything they did for me on my house"
5★★★★★ - "Fast, friendly service at a reasonable price. Two days after I called, I had a newly painted roof. It looks great. I'll definitely consider Watsons for future projects." 5★★★★★ - "I had my 2 car garage painted/epoxied and the job that Barrington and Cal did was phenomenal! It looks like a showroom floor with the flakes they put down and the shine is like a new garage floor! Love their hard work ethic and professionalism!!" 5★★★★★ - "We had a hole filled, uneven surface after removing our back splash tile. Mr. Barrington came in and did a beautiful job fixing the surface, cleaned up afterward while being friendly and helpful." 5★★★★★ - "Look no further!!! Call Watson now. I called to inquire about fixing many damaged walls in my home at 8am and at 10am I was greeted at my front door by Watson's big smile and warm personality. He gave me a reasonable price and got right to work. I thought these walls would never look good again because the damage was pretty severe but I was wrong. A couple hours later I thought I was in a new house. They came out better than I ever could have expected. I've dealt with home services for 40 years in Florida and this guy is truly special. Here's why.... He was on time, we had great communication, and the job was done perfectly and at a reasonable price. I can tell you that you are lucky to get one out of four of these qualities from most in Florida. I am still waiting for a screening guy to call me back from last week!!! Enough said... He has earned my business for life!!!!" 5★★★★★ - "Excellence from start to finish at a reasonable price. Ripped out old wallpaper, spackled holes and painted mom's condo for resale. Professional in every manner. Would hire without hesitation." 5★★★★★ - "Mr. Watson was a true professional from our initial meeting where he gave me a very fair quote to the excellent job performed. I would highly recommend his company for your needs. He painted my mom's condo to freshen the look after 30 years for an imminent sale. It sparkles like brand-new!!! He removed all the old wallpaper, spackled multiple picture hook holes and painted it to a fresh and clean look that should appeal to any buyer!!! Thanks Barrington Watson!!!" 5★★★★★ - "Fantastic! Barrington and his team were on time, professional, conscientious, and paid attention to all the details. Unbelievable job and finished sooner than expected. A real pleasure to work with!" 5★★★★★ - "Fantastic! Highly recommend, they did amazing work with great attention to detail. Will definitely use again!" 5★★★★★ - "Mr. Watson and his partner, Carl did an excellent job!! They arrived 10 minutes early for the scheduled appointment. Mr. Watson was professionally dressed in a 3 piece suit!!! His demeanor and knowledge about his field makes him an excellent person to work with. The repairs were so well done, one would not be able to tell there was an issue. His personality makes him feel like one of the family. I would highly recommend him to anyone and would certainly use his services again." 5★★★★★ - "Mr. Watson recently stained my patio deck. He was prompt and his work was very professional. I would definitely recommend him!" 5 ★★★★★ - "This company is a star! They take pride in their work and work in every possible way to please the customer. They did an epoxy floor and wall painting for us and the final result was very pleasing, surpassing our expectations. Pricing is reasonable and I would recommend them anytime." 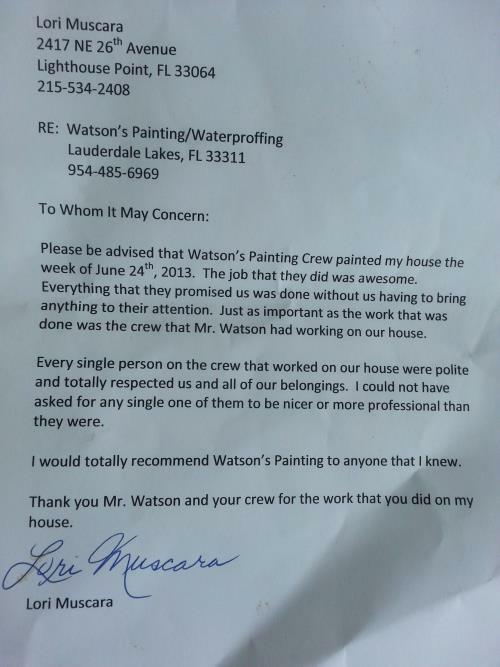 5 ★★★★★ - "I hired this company, "Watson's Painting and Waterproofing" 4 months ago to paint the exterior of my house. I must say, Barrington was a pleasure to work with. He is jovial, friendly, and has an upbeat personality that will put a smile on anyone's face. For those of you who have worked with him, you know what I mean! Not only did he paint the exterior of my house, he pressure cleaned my roof and it is the best pressure cleaning I had on this home to-date. I had pressure washing companies do my roof before and the roof got dirty in no time. Barrington cleaned my roof properly and going on five months later, my house and roof looks impeccable. I had contractors compliment the paint job and the roof. I usually don't do a review quickly, I like to wait and I must say I am happy and satisfied with his services. He is on top of the game." 5 ★★★★★ - "I want you to know that I am very pleased with the quality of service and the pride they take in performing their tasks. I have recommended your company to others because of my satisfaction with your work. I am looking forward for my project to finish and we will have a long and lasting business relationship." 5 ★★★★★ - "We had Barrington come to our home and fix the walls and take off the rest of the wallpaper in our nursery. He was very professional and friendly; one who cares about quality customer service. We are very pleased with the work that was provided and would definitely call them again for any additional work that we may need for our home." 5 ★★★★★ - "Watson's Painting, Co has done a super job. I love u Watson. I will recommend u to all my friends. Very efficient and reliable. Thanks a million." 4 ★★★★☆ - "Barrington was up to speed and the work was excellent. Great job for the price." 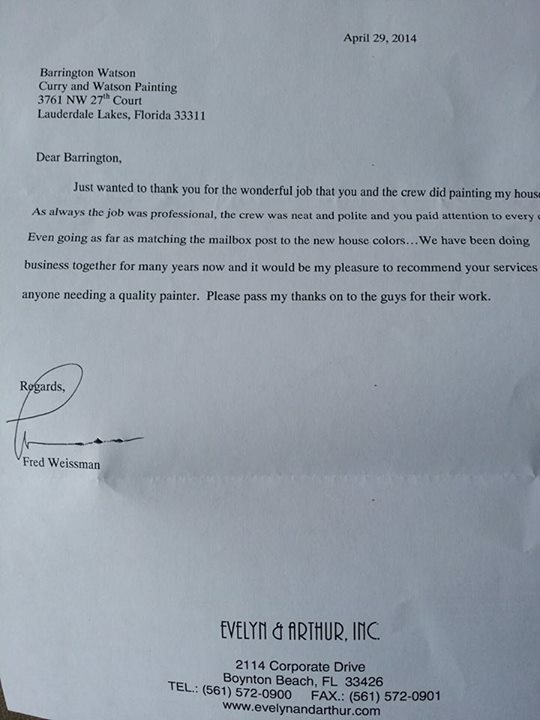 5 ★★★★★ - "Jerry at Southwest 9th Street Pembroke Pines Florida hired Barrington Watson's Painting Company to do a interior paint job for me job was excellent I will recommend Barrington with Watson's Painting Company to any customers who are seeking a good painting contractor"
5 ★★★★★ - "Mr. Watson and his crew just finished painting the interior of our home. We found them to be professional, clean and neat. The job was finished sooner then expected. I would highly recommend them." 5★★★★★ - "I would absolutely recommend Watson's Painting. Barrington and Carl were very professional and did everything to make sure the job was done correctly. Thank you!" 5★★★★★ - "I just wanted to thank you for the great job you did on repairing the ceiling in my den today. You were able to see, review and do the job all at the same visit and reasonable pricing too boot. There is much to say about your meticulous work area for that i am thankful. Great job." 5★★★★★ - "I would like to take this opportunity to thank Watson's Painting and Waterproofing for their excellent work....<<read more>>"
"I would like to both thank and commend you on a most professional interior painting job that you and your company did. 5★★★★★ - "Watson's has been my go to resource for my Home Painting needs for over ten years, They do an excellent job. Highly recommended." 5★★★★★ - "I want to thank you and your crew for the outstanding job that you did in painting our garage, including the garage floor. Your efforts to make sure that the job was done correctly and that we were fully satisfied was very appreciated. The work you performed was very skillful. I wish you and your family and staff a happy holiday." 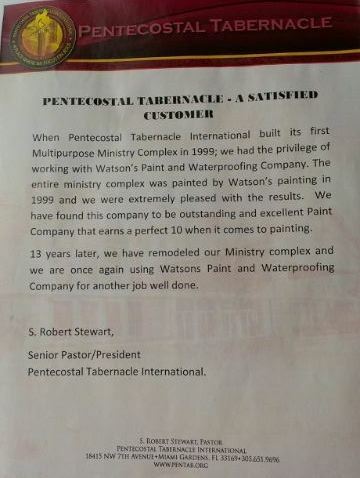 When Pentecostal Tabernacle International built its first Multipurpose Ministry Complex in 1999; we had the privilege of working with Watson's Paint and Waterproofing Company. The entire ministry complex was painted by Watson's painting in 1999 and we were extremely pleased with the results. We have found the company to be outstanding and excellent Paint Company that earns a perfect 10 when it comes to painting. 13 years later, we have remodeled our Ministry complex and we are once again using Watson's Paint and Waterproofing Company for another job well done. 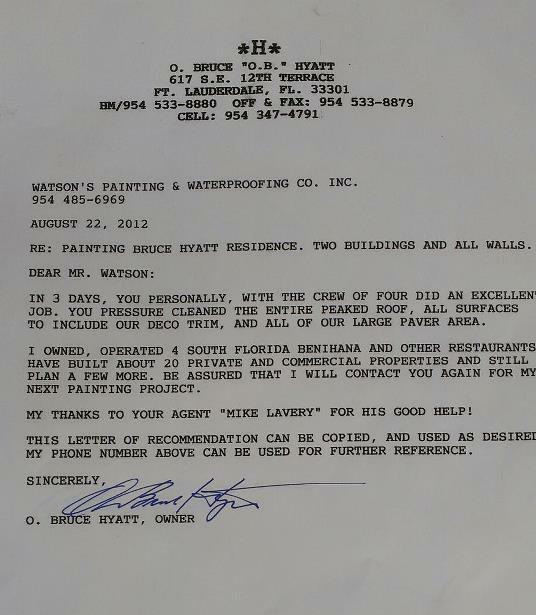 "Watson Painting has recently completed Haven House #4, located at 130 E. Sample Rd., Pompano Beach, FL. I am happy to recommend this company to other condo associations. They did a quality job, on time and within the original budget. Barrington, one of the principals, was on the job daily and make sure the workmanship was of the highest standards. If you have nay questions please feel free to call me at 954-663-7369." 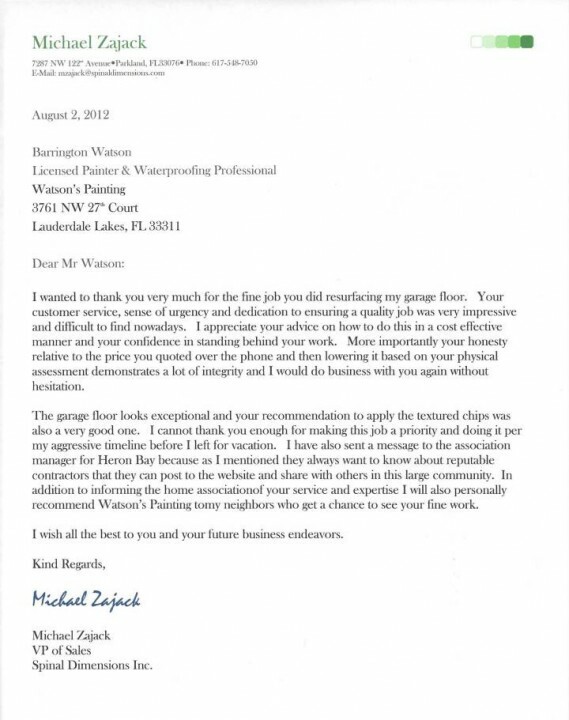 "I wish to take this opportunity of thanking you for the excellent job your company did in painting the interior of runaway bay condominium. All work was done on a timely basis and we greatly appreciated the clean condition in which the building was left at the completion of each days work. Your workmen are to be commended for the courteous manner in which they conducted themselves each day that they were here. Our condominium would be most happy to recommend your company to any future clients." 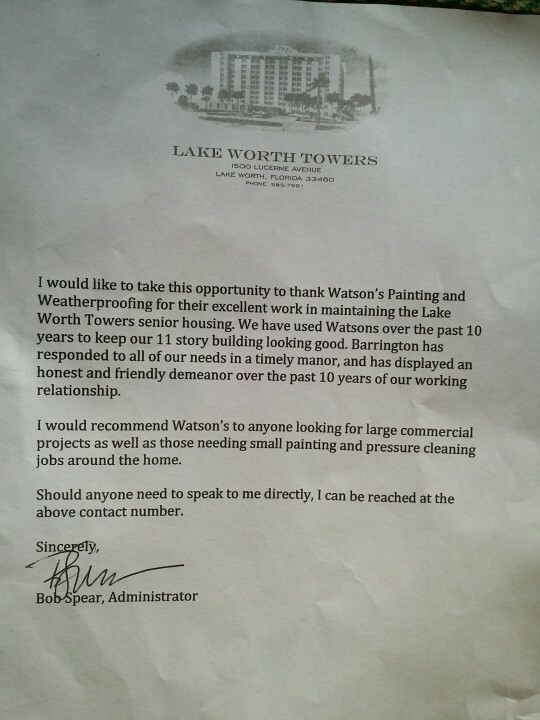 "I will recommend your company, Watson's Painting and Waterproofing Co, Inc, to my clients and friends. This old 1958 home really needed your special work and services. The process of cleaning, patching, repairing all the painted surfaces, sealing, base coating and the type of paint used applied by spraying & rolling was what was needed. The home had been added and changed over the years, plus the hurricanes the past 2 years really was hard on the walls and wood trim. This home needed much more than lipstick and rouge. You and Peter and Oats certainly did a wonderful job. You helped me select the correct colors and made any small changes I wanted. Thank you so much for a terrific job and all started and finished in 2 days. You are fair and honest, you have my highest receommendation." 5★★★★★ - "I am delighted to recommend Watson Painting. They did a great job finished ahead of schedule. Watson Painting exceeded my expectation by going over and above their scope of work. They are very easy to deal with and I have zero complaints."